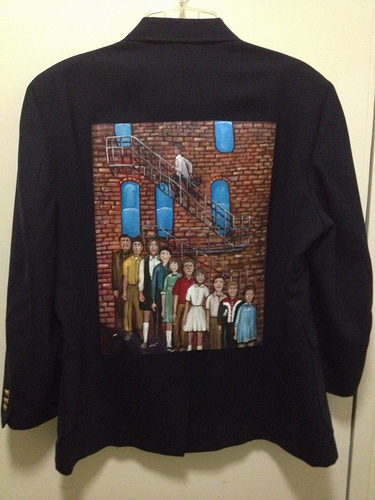 This is a story about the jacket painting of TomEvans, MD. This is a story about the jacket painting of TomEvans, MD. If you read Tom’s biography you’ll see many accomplishments in his long career. He has succeeded at so many things. He is President and CEO of Iowa Healthcare Collaborative. He has a BA, MA and MD to his name. He was the Chief Medical Officer at Iowa Health System. 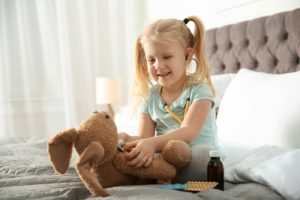 He was on the board of the National Patient Safety Foundation and is currently working with HEN’s in the Partnership for Patients Initiative. But today we are going to hear about Tom’s failure. Tom is the eldest of nine children. So like many large families they were arrayed as stair step order in family portraits. 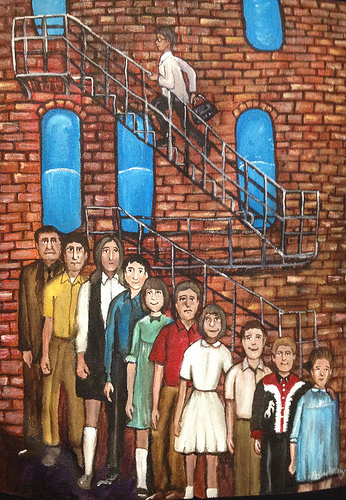 In this painting you can see Tom, his father and all of his siblings in descending order. “This story is about my mother. As a family physician, and she a nurse, we always had a fairly frank and open discussion about medical issues. These took on an entirely new and unexpected dimension when her health began to fail. I am the oldest of 9 children born over an eleven year span. I think we were more of a herd than a family sometimes! My mom was an RN and worked nights at the hospital. Dad was an insurance agent. My parents were always there and worked hard to make sure everyone had what they needed. Mom became diabetic late in her 50s. Always too heavy and non-compliant with diet, she never took real good care of her diabetic management even though she was a nurse. I think she was in denial. She was happy, loving mother and the perfect grandmother to our kids. Complications began to catch up in her 70’s and by age 77, she had accumulated several medical conditions that made her a prime candidate for the medical system. Her diabetes was a constant challenge in balancing diet and insulin (she ­refused to exercise!). She also developed heart disease. She had a “silent” heart attack (no symptoms) and almost died. After a valve replacement and bypass surgery, she was recovering nicely when the wheels began to come off. As the oldest son and a physician, my role evolved to make sure Mom’s medical needs were met. I found myself mentally moving from “visiting my parents” to a “making house calls” mentality. I also became quite vigilant for patient safety issues in her care. I saved her life three times from medication safety issues. Twice when in the hospital, she was over-medicated with narcotics. Neither situation required Narcan, but both required significant observation and dosage adjustments. The most dramatic intervention what when my father called me over to their home to evaluate Mom as she just wasn’t right. I watched her become unresponsive before my eyes and called 911. Before the ambulance arrived I put together that she might have double dosed her insulin. While a normal blood sugar is between 60 and 110, hers was 7. She was having a hypoglycemic reaction and needed hospitalization. In the last year of her life, I spent a lot of time with my Dad just trying to keep Mom stable and in the home. Dad was managing her diet, housework, medical regimen (now after the insulin episode), the farm…and burning out. Mom was occasionally a little confused, and had also begun falling. While she had never been graceful, but she just seemed to be “sliding down” through weakness now about twice a month. When Dad was out one time, I came over and found Mom on the floor. She was fully conscious and content, but unable to get up. When I asked how long she’d been there, she replied about an hour. She was just waiting for Dad to help. I expressed to Dad my concern about his ability to care for her at home, and he basically said he would die before putting her in a nursing home. So we went on. Interestingly, her diabetic control was the best it had ever been, so I thought I was doing a good job. On New Year’s Eve I got a call at 2 a.m. from Dad asking me to come over and check Mom. After watching “Guy Lombado reruns”, they were heading to bed and Mom fell in the kitchen. She hit her face on the floor, but more importantly, couldn’t move her right arm. She had broken her humerus and was admitted to the hospital. On the way home with my dad that morning, I noted that her care at home now exceeded his capability and he should consider a nursing home. The physician taking care of Mom in the hospital requested a “palliative medicine” consult. Because this is usually reserved for patients at the end of their life, I didn’t really think this would do much good. The next day my dad and I were called in for the results. We were strongly encouraged to consider hospice placement. Though my mom didn’t have cancer, or some fatal debilitating disease, she had developed “failure to thrive” over the past 6 months…her body just wore out. Her falling, increased weakness, confusion and decreased appetite were all signs of this…and I missed it. The reason her diabetes was under such good control wasn’t that her medication regimen was finally good…it was that she had basically quit eating. When we discussed this situation with Mom in the hospital, and she whole-heartedly agreed. 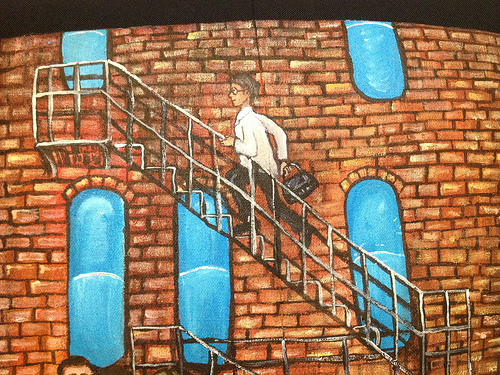 So within this image I painted Tom racing up a fire escape, as metaphor, to once again rescue his mother. The windows have become the pills she is supposed to take. We live within a world focused on rescue and in the case of fire that can be a great thing. But within our lives it leads us believe there is always one more treatment, one more path of care, when eventually each of us must end. We must appreciate ends as much as we do beginnings. 1) Medication safety is a huge issue. Adverse drug events account for 38% of the improvement opportunity for the Partnership for Patients hospital acquired conditions. Just few classes of drugs account for about 75% of medication harm. Work focused on blood thinners, management of blood sugar, and pain medication can eliminate a lot of unintended consequences for our patients. It takes vigilance and teamwork as the family and care providers work together for the best results. This communication is critical. We need both sets of eyes to see reality. Patient and families are part of the healthcare team…and must claim the statement “nothing about me without me”. 2) As a society, we don’t do “end of life” transitions well. 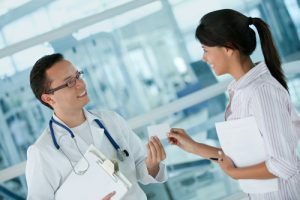 Often the medical community considers dying a failure, and providers may vacillate from over delivery of care and total disengagement. The patient’s true wishes may not really be considered, and the family is left starved for information and confused. I found myself stuck between the roles of provider and family in this situation, and am embarrassed to note that hospice placement didn’t even occur to me…I was fixing her problems and missed her problem. I wish someone had thought about end of life strategies sooner. I wish I could rewrite the last 8 months of her story for the sake of both my mom and my dad.